While the EPC boosts the performance, the mild-hybrid system (MHEV) helps to improve fuel efficiency. The 48-volt MHEV system comprises a belt alternator starter (BAS) and a lithiumâ€‘ion battery with a capacity of 10 Ah housed in the vehicle floor beneath the luggage compartment. The BAS is connected to the crankshaft. During deceleration it can recover up to 8 kW of power, which it then stores in the lithium-ion battery. When the driver accelerates again, the BAS reacts instantly by restarting the engine. On that basis, the S TDI models combine impressive driving dynamics with high efficiency, low fuel consumption and low emissions. All S TDI models have homologation to the Euro 6d temp emission standard. 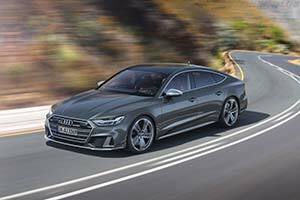 The WLTP values correlate to an NEDC fuel consumption for the Audi S6 sedan of 6.3 or rather 6.2 liters of diesel per 100 kilometers (37.3 or 37.9 US mpg) and CO2 emissions of 165 or rather 164 grams per kilometer(265.5 - 263.9 g/mi), depending on the tires/wheels used. The figures for the S6 Avant are 6.5 liters per 100 kilometers (36.2 US mpg) and 171 g/km (275.2 g/mi), and 6.5 liters/100 km (36.2 US mpg) and 170 g/km (273.6 g/mi) for the S7 Sportback.